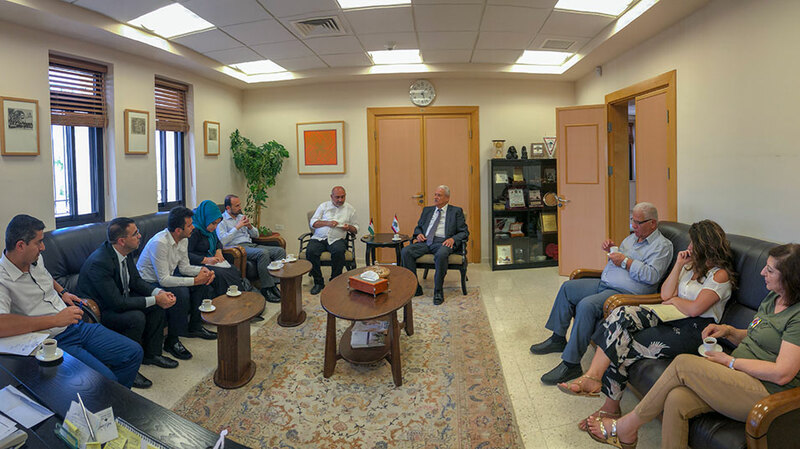 A delegation from the Presidency for Turks Abroad and Related Communities (YTB), an institution under the Prime Ministry of Turkey, visited Birzeit University on August 7, 2018. Both parties focused on offering international scholarships for undergraduate and graduate students through the Turkiyeh Burslari Scholarships. The scholarship is a government-funded higher-education program designed for international students. It is offered for undergraduate and graduate students, as well as researchers. University President Abdullatif Abuhijleh and the delegation discussed the possibility of offering this scholarship to Birzeit University faculty and students to continue their educations in Turkey, while ensuring the continuity of their relationships with their home country after the completion of their studies. In addition to Abuhijleh, Assistant to the President Aziz Shawbkeh, and External Academic Relations Officer Amir Khalil represented Birzeit University at the meeting.